In a typical school year, you will pass by all of your staff at one point or another. Some staff you talk with regularly, whereas some colleagues you only see at staff meetings. It’s possible for an entire school year to go by before you realize that you have barely spoken to each other. In education, we can so easily move into silos that work against creating a strong school culture and climate. Silos bring down staff morale! Phil Boyte has long been someone that I admire for the difference he has made in thousands of schools and in countless students and educators lives over many years. In his insightful and powerful book, School Culture By Design - Building & Sustaining Positive School Culture, he speaks of Educational Silos through an empathetic lens to understand them and move forward to create an ideal school culture by design. Phil talks about “The Silo (Un)Merry-Go-Round” that includes things like isolation and competition, gossip and hostility, confusion and resentment, and lack of integration. Sound familiar? Phil also talks about the fact that, “there is a reason people disengage from the larger whole,” and that, “every silo has a story. Learn it.” You can purchase Phil’s Book on his website by clicking HERE. It is a must read! Having seen school through the lens of a classroom teacher, student activities advisor, coach, and district administrator, I have seen first hand what Phil speaks about in his book. It was amazing to me how many times it was the staff to staff connection (or lack thereof) that was a driving force behind a positive or negative school climate in our school. While we are working hard to serve the students as best we can with little time, limited resources, and a frantic pace - we need to remember that we make or break each other’s days more than we might realize. What if we were more intentional with creating an environment where staff want to show up everyday because of the relationships and connections we have with each other? The following ideas come from our 40 Week Staff CharacterDare (included in our CharacterStrong Gym) that schools have access to when using our school-wide character development and social emotional learning curriculum. For more information you can click HERE. People support what they help to create, so here are four ways to improve staff morale at your school. 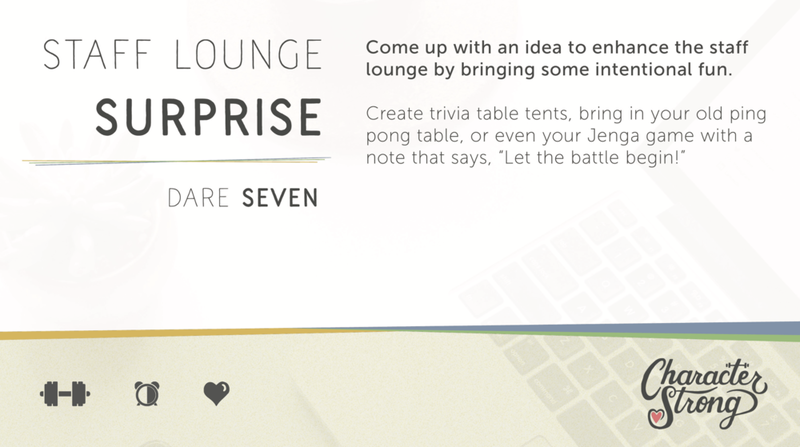 Come up with an idea to enhance the staff lounge by bringing some intentional fun. Create trivia table tens, bring in your old ping pong table, or even your Jenga game with a note that says, “Let the battle begin!” It doesn’t have to be elaborate or cost a lot of money, just be intentional and invite people to connect, laugh, and play. On of our favorite, anonymous quotes: “You can learn more about someone in an hour of play than a lifetime of casual conversation.” We may never have hour-long lunches, but we can be the ones to start improving our school climate and culture by bringing some fun to the staff lounge. 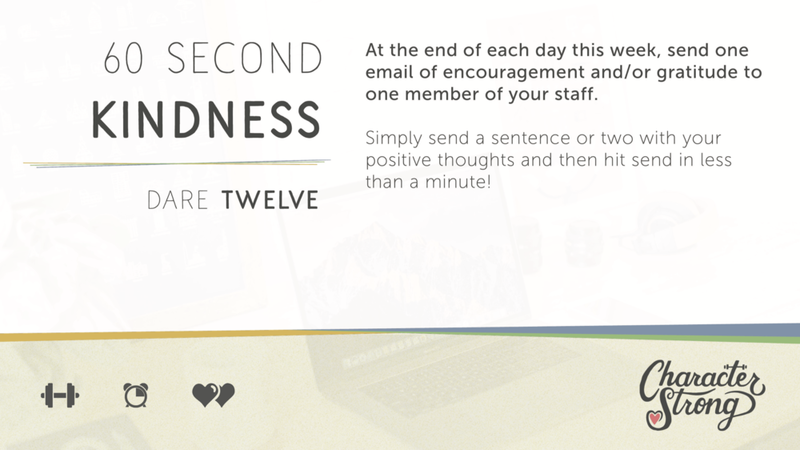 At the end of each day this week, send one email of encouragement and/or gratitude to one member of your staff. Simply send a sentence or two with your positive thoughts and then hit send in less than one minute. The reality is that we are never going to feel like there is enough time, yet if we are intentional in many ways the time is there if we make time for that which is most important. Taking one extra minute before heading out the door to send a simple positive statement to a fellow colleague could go a really long way. How many times do you send an out of the blue compliment or note of encouragement and the person responds with, “How did you know that I needed that?” The fact is that we don’t always know and yet what did it cost...60 seconds or less of intentional kindness. Take 5-10 sticky notes and write a short, encouraging message that would inspire, remind, and/or positively challenge any staff member in your school. Put them in random staff mailboxes in the office or staff lounge area or directly on their door. We need to be reminded more than we need to be taught and it is easy to be reminded of the difficult times that we experience during the day. We need to work hard to bring in positive reminders. The work educators do is positive, powerful, and purposeful for creating a better world through our students. Let’s remind each other of that influence and opportunity we have each day. I firmly believe that every staff member in a school is an educator. We all teach every day through our interactions with others, how we treat them, how we respond to them, and how we carry ourselves moment to moment. Sometimes we need practical ideas and reminders on what we could do to positively connect with and impact others around us. All members of a school community are responsible for the culture and climate of that community. What are you going to do today to improve the staff morale of your school?